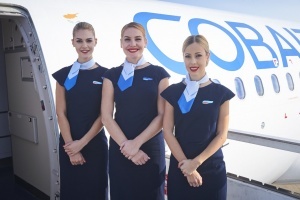 Cyprus-based airline Cobalt Air has ceased operations after failing to agree new financial arrangements with creditors. The low-cost carrier, which operated flights to Stansted, Gatwick and Heathrow in the UK, said all flights would be cancelled from 23:50 on Wednesday night. Passengers with outstanding tickets were urged not to go to Larnaca or any other airport, as no further departures were planned. No Cobalt staff would be present, a statement from the airline added. Passengers were advised to seek compensation from their credit card providers or travel agents. “We sincerely apologise once again and would like to thank our very loyal customers for their support over the last two years of Cobalt operations,” read a statement from the airline. Before 2016, short-haul flights out of Cyprus were dominated by state-controlled carrier Cyprus Airways. Cobalt had sought to move into the space vacated by its collapse. The cancellations came after Danish budget carrier Primera Air ceased trading earlier this month.